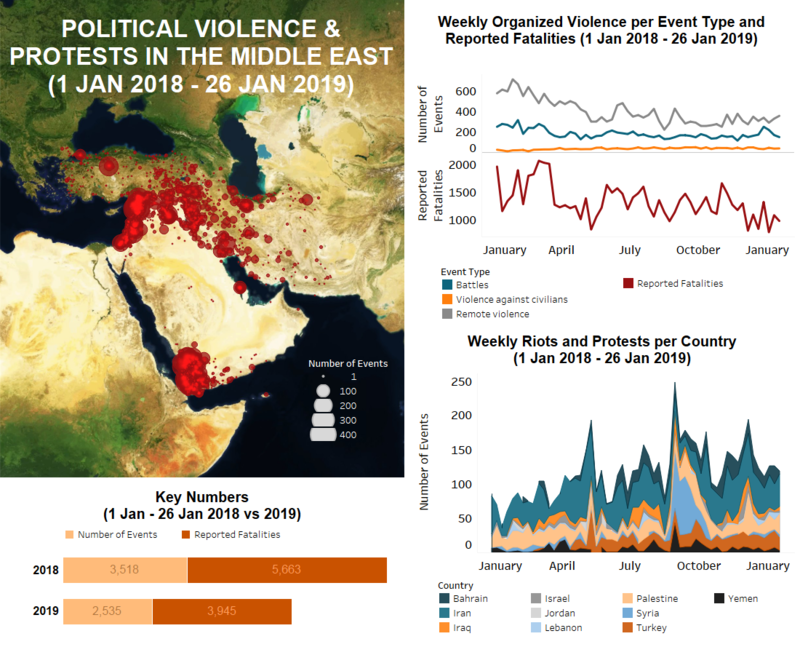 Throughout the Middle East region last week, instances of remote violence have continued their upward trend since the beginning of January. At the same time, battles have consistently decreased within the same time period. Overall, reported fatalities from these events have decreased only slightly. These trends are mostly a result of actions within Syria and Yemen. Elsewhere, riots and protests have also decreased somewhat, most notably in Bahrain. In Palestine, last week began with a number of airstrikes and clashes between Israeli forces and Hamas militants in northern and central Gaza. One Hamas member was reportedly killed by an Israeli tank shell east of Al Burayj refugee camp. This latest round of violence began on 22 January after an Israeli officer was hit by a bullet fired by Hamas militants during a border demonstration in the Kissufim area. Elsewhere in Gaza, Israeli forces reportedly shot and killed a demonstrator during the 44th Great March of Return agitation east of Rafah. In the West Bank, four Palestinians were reportedly killed last week in various incidents involving settlers and Israeli forces. At the same time, there were numerous incidents of stone-throwing between Palestinians and settlers. On 21 January, Israeli forces raided parts of Ofer prison outside Rafat, leading to clashes that resulted in the alleged injury of over 100 Palestinian prisoners. This event triggered a hunger strike among prisoners and prompted solidarity demonstrations in major cities across the West Bank and Gaza (Middle East Eye, 22 January 2019). In Israel, there was considerable focus in the media on Israeli bombings in Syria. Due to heightened tensions with the northern Syrian border and the southern Gazan border, Israeli forces deployed parts of the Iron Dome missile defense system in the Gush Dan area. Additionally, there were protests led by centrist parties to demand political unity, by Druze groups against the Nation-State law, and by environmental activists for the removal of gas rigs in the Haifa area. In Jordan, two protest demonstrations took place in Amman on 24 January. One protest was led by the Islamic Centre Society’s follow-up committee, which demanded the reinstatement of members who were dismissed by the society’s administration. The other took place near the Fourth Circle, where a few hundred people rallied for the ninth week in a row, demanding political and economic reforms. In Lebanon, hundreds of protesters demonstrated in Beirut on 20 January to call for better public services and solutions to environmental and economic problems facing the country. The Lebanese Communist Party and the Popular Nasserite Organization led the protests along with a number of workers’ unions and independent groups. Meanwhile, dozens of protest demonstrations took place across Iran last week. Noteworthy were several demonstrations by teachers in at least six cities, including Tehran. Teachers have been continuously staging protests over the last several months to demand higher wages, especially since the recent devaluation of the Iranian currency has led to high inflation rates in the country. They have been furthermore demanding better health insurance and retirement benefits. Since parliament has been recently assessing the annual budget plan proposed by the Rouhani administration for the Iranian year beginning on 21 March 2019, teachers have increased their effort to lobby for a larger share (Al-Monitor, 6 January 2019). Moreover, the protesting teachers demanded the release of their colleagues who are imprisoned due to labour rights and union activities. In a report published last week, Amnesty International indicated that Iran arrested more than 7,000 political dissidents in 2018, including at least 23 teachers (Amnesty International, 24 January 2019). In Bahrain, demonstrations continued last week to a lessened degree. The majority of the protests were peaceful and involved Shiite groups demanding the release of Sheikh Ali Salman, the imprisoned Secretary General of the Al-Wefaq political society, as well as other political prisoners. In Turkey, there was a large protest march by lawyers in Istanbul on the occasion of Lawyer’s Day which called attention to dangers faced by them in the country. Meanwhile, at least two demonstrations led by the Peoples’ Democratic Party (HDP) were stopped by police in Diyarbakir province. The demonstrations were part of an ongoing movement in solidarity with Kurdish political prisoners. Last week, a leader of the movement, MP Leyla Guven, was released from prison following a 77 day hunger strike (Middle East Eye, 25 January 2019). In the southeast, clashes occurred between Turkish military forces and Kurdistan Workers’ Party (PKK) militants in several provinces, including Sirnak, Diyarbakir, Mardin, and Igdir. However, there were twice as many PKK fatalities reported in northern Iraq as a result of Turkish airstrikes on their hideouts in the governorates of Erbil and Dahuk. In addition to these, at least four civilians were allegedly killed in an airstrike near Sheladiz on 26 January. This prompted Kurdish locals and PKK sympathizers to storm a Turkish military base in the town. Two of the demonstrators were reportedly killed, and others injured, when Turkish forces fired on them. Elsewhere in Iraq, there was a surge in Islamic State (IS) attacks on police forces. In Diyala governorate, five police were reportedly killed by IS sniper fire. This comes as Iraqi security forces continued their attacks on IS hideouts and their seizure of weapons caches throughout the country. In Yemen, Saudi-led coalition airstrikes resumed in Sana’a, with warplanes targeting Houthi military targets near the international airport and the areas of Bilad Ar Rus and Sanhan just outside the city. At least 35 other airstrikes were also conducted by the coalition throughout the country. 24 civilian fatalities were reported as a result of remote shelling and landmine incidents, including by an artillery shell that hit an IDP camp in Hajjah. Houthi forces fired at least seven ballistic missiles at anti-Houthi forces and Saudi military sites throughout the week, with missiles targeting the Khalid Ibn Walid military camp in Taiz, as well as military outposts along Saudi Arabia’s southern border districts of Jizan, Asir, and Najran. In Hodeidah port city and its surrounding areas, clashes and shelling incidents continued to increase last week despite attempts to enforce a ceasefire. Meanwhile, Al Qaeda in the Arabian Peninsula (AQAP) and IS militants continued to clash in Al Bayda governorate, with both militant organizations also targeting Houthi forces with roadside bombs. Soldiers in the 35th Brigade (containing Abu Al-Abbas elements) began a new operation targeting AQAP leader Bilal Al-Wafi in the western outskirt areas of Taiz governorate. Lastly, battles were fought between anti-Houthi/Coalition forces and Houthi militiamen across all the major fronts. The former reported minor territorial gains in Baqim, Haydan, and Razih districts of Sadah governorate. In Syria, a new wave of Israeli airstrikes targeted military positions, air defense batteries, and airports controlled by the Syrian Army and Iranian Quds forces in Rural Damascus, Dar’a, and As-Sweida governorates. The strikes caused material damages and reportedly killed at least 21 fighters. Meanwhile, Syrian Democratic Forces (QSD) and Coalition fighters continued to make territorial gains in the last IS enclave within Deir-ez-Zor governorate. By the end of the week, the groups controlled the towns of Muzan and Upper Baguz, leaving IS with only the Marashdeh area along the Euphrates River. This latest operation has been ongoing since 10 September 2018, with an earlier May 2018 operation against IS being halted due to a lack of success. In the northwest, Hayat Tahrir al Sham (HTS), rebel, and Islamic factions engaged with regime forces in sporadic clashes and shelling exchanges within and along the DMZ in Aleppo, Hama, Idleb, and Lattakia governorates.